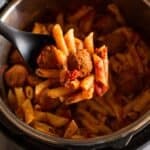 I love instant pot recipes that yield a complete meal, with minimal prep, like this Instant Pot Penne Pasta with Meatballs. 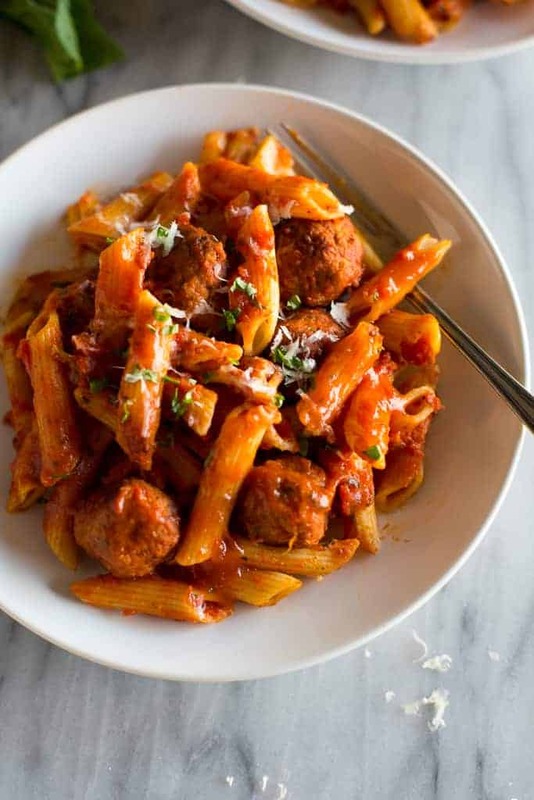 Uncooked penne pasta, meatballs and a simple homemade tomato sauce are added to the pot together, and dinner is ready in just a few minutes! I have a handful of all-in-one instant pot meals, like this one, that my family LOVES and I make on a regular basis. Our favorite is probably Instant Pot Chicken Taco Bowls followed closely by Instant Pot Tuscan Chicken Pasta and Instant Pot Meatloaf and Mashed Potatoes. I really look forward to sharing this type of Instant Pot recipe because I know so many of you share my enthusiasm for meals you can dump in the instant pot and have dinner ready and nearly the snap of your fingers. This pasta is especially kid-friendly and I’m confidant your family will love it! 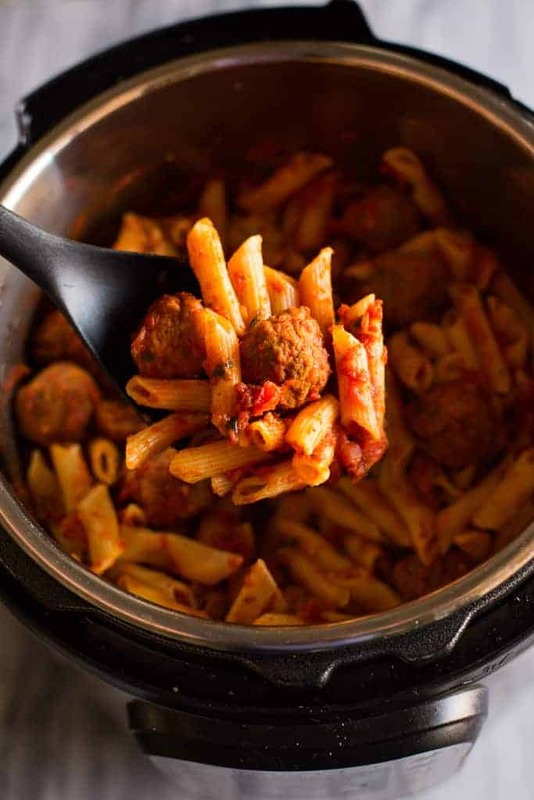 Gather the ingredients you’ll need, including uncooked penne pasta, a can of crushed tomatoes, tomato sauce, meatballs (frozen or fresh), and spices. 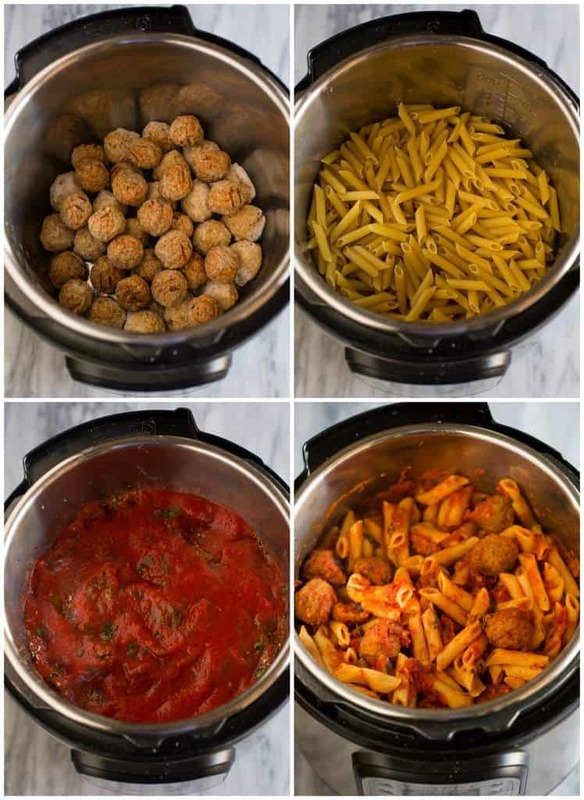 Start by layering your frozen meatballs in the bottom of the Instant Pot. Add the pasta on top of the meatball and spread it into an even layer. Pour the water on top of the pasta. Add the crushed tomatoes, seasonings, and tomato sauce on top and gently stir it with a spoon, making sure that the sauce completely covers the noodles. The general rule of thumb for cooking pasta in the instant pot or pressure cooker is to cook it on high pressure for half the amount of time noted on the box, followed by a quick release. You can use pre-cooked frozen meatballs for this recipe or you can make your own meatballs from scratch. 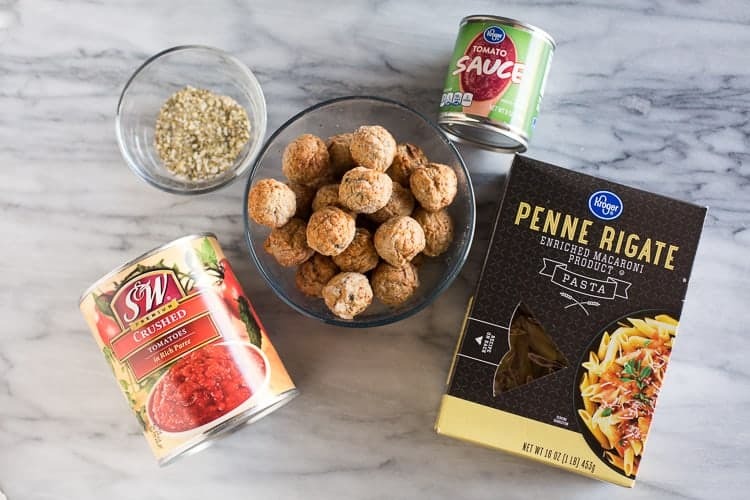 To cook frozen meatballs in the Instant Pot, simply layer them at the bottom of the instant pot, add uncooked pasta and water on top, followed by tomato sauce and spices. Then cook on high pressure for half the time noted on the pasta box. To cook raw meatballs in the instant pot, first turn the instant pot to sauté mode. Spray the bottom of the pot with cooking spray. Quickly brown the meatballs on all sides (they should still be uncooked in the middle). Then layer them at the bottom of the instant pot, add uncooked pasta on top, add water and top with desired sauce. Then cook on high pressure for half the time noted on the pasta box. Substitute crushed fire roasted tomatoes to add some heat and bold flavor. Thanks Lori, I’m so glad you liked it! Made this for dinner last night & it was yummy. Made a few alterations, the dish was too watery for our taste, so I drained most of the liquid once pasta was cooked & tender (next time will reduce the water to 2 cups). I cut the half & half measurements to 2 table spoons. Once I stirred the half & half in, I sprinkled the dish with Romano & low fat mozzarella. Put the lid on the pot & simmered it for 5 min. So didn’t have to use the oven. This is a fantastic recipe & a keeper. Lauren THANK YOU for this wonderful recipe and your great blog.